Nothing but great things to say about this place. A very nice family owns it and help you out with everything. The rooms are very nice and the place is very well keep. Whatever you need they have it. They give you advice on what to do and you can book everything there. 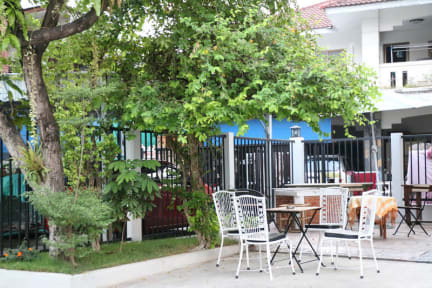 Location is fantastic right near the city but tucked away on a nice street to give you a peaceful night. Amazing service they go out of their way to give you the best experience. This is the only place I will stay in Chiang Mai. Excellent hostel with wonderful staff. My room was cleaned every day and the shared showers seemed to be cleaned several times per day. There is a nice rooftop balcony area to chill and eat breakfast. I will undoubtedly stay here again in the future. What a great place to setup home base for the week. Super comfortable and clean accommodations and the staff are so friendly and helpful with booking tours and really anything you need. Great location too. Tucked nicely out of the way but less than a ten minute walk to pretty much all the markets and popular spots. Would definitely stay here again. We have ABSOLUTELY LOVED our stay here at The Ghee House, so much so that we ended up extending our stay from 3 nights to 9 nights total. We felt sooo comfortable here, as if we were home. It's run by the sweetest family who is beyond helpful with recommendations for the area, helping arranging transportation/things to do, and sending your laundry out. The bathrooms are cleaned frequently throughout the day, and they are super accommodating to anything you may need. 10/10! Thank you!!! Extremely helpful staff! 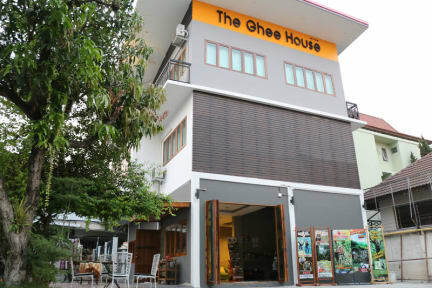 We stayed in Ghee House number 2. It was beautiful. The location was great! Would stay again was one of the reasons we loved Chang Mai. Really great hostel to stay at in Chiang Mai. The location is perfect, 5-10 minute walk to everything you need. The lady who works here is so friendly and helpful, she is always willing to give you information and book anything for you and will usually give you a bit of a discount which is always nice. Cleanliness was amazing and the rooms were very nice and comfortable. Very helpful and friendly staff. Excellent WiFi. Rooms cleaned everyday with free bottled water. Very clean. Small locked safe for valuables. Free tea/coffee. Great place to stay after Sonkran to chill out. Great staff and cleaned daily. Only thing that would be better would be for a pool and breakfast. The owner and staff were incredibly friendly and helpful here. It is located down the soi’s about 7 minutes walk from Thapae Gate and 10 minutes from the Wararot markets, so it is in a convenient and quiet location for travellers - although be warned that the soi can be tricky to navigate and you’ll want to be armed with a map at all times. There was no social atmosphere at all for my stay, however it is a private guest house and not a hostel so I gave it a pass for that. Stayed here twice throughout my Thailand trip. The owner was always in a helpful and great mood. The hostel is immaculate in terms of cleanliness. The shower pressure is the best I’ve ever experienced in a hostel.